The purpose of this document is to list a troubleshoot path to follow when reports cannot be printed from AX 2012. The contents are not fully covering all options available but points out a toolbox for handling often seen issues. Is it all reports not printing? Try printing one of the most simple reports available. I usually use the Departments report found in “Organization administration / Reports / Base data / Departments”. If that one prints successfully it is probably not the SSRS causing the problem. Is SSRS set up correct within AX? AX has a very flexible setup regarding SSRS. Each AOS has – and must have – its own relation to an SSRS. All AOS’s can point towards the same SSRS but it is also possible to address the reports from each AOS to its own SSRS instance. One AOS can on top this have multiple relations to different SSRS instances. However, only one relation can be default and active. So how do we make sure all this works? 2. Validate the relations using the “Validate settings” button. 3. Verify that the specified URLs are valid. Is SSRS set up correct regarding connection to AX? With AX pointing towards the right SSRS instance we need to make sure that the SSRS instance points towards a valid AOS. 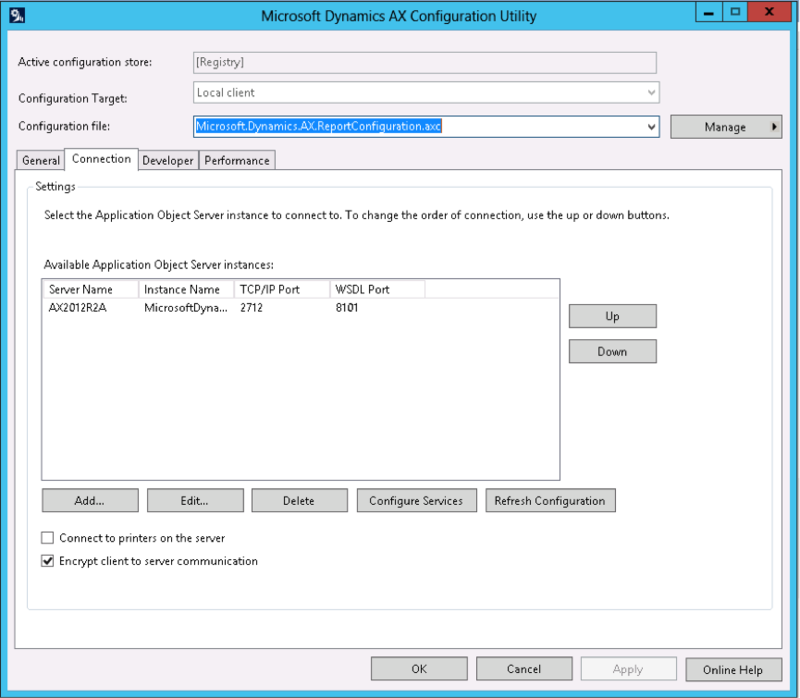 With only one SSRS instance on the server it – by default – looks up the default client configuration on the server to access AX. Having multiple SSRS instances on one server requires each instance to have an configuration file with the name Microsoft.Dynamics.AX.ReportConfiguration.axc. Make sure that this configuration file is valid. For instance by opening a client with it if possible. 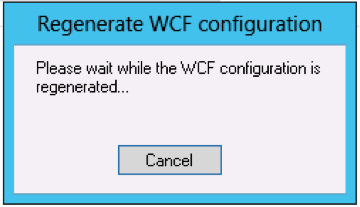 Also make sure that the WCF part of the file is fully updated. To rebuild the WCF part follow the description in the section Rebuild the WCF part of the AX configuration for the SSRS. Another way to test that multiple instances points towards the correct instances is to create eg. a department called “Development” in a development environment and one called “Test” in the test environment and then verify that these are shown when printing from the relevant AX environments or the SSRS report manger site (see description of how to print from outside the AX client). Does it print from outside the AX client? SSRS offers a web frontend allowing us to test – at least some – reports from outside AX pretty easily. To do so you need to find the URL address to the report manager site. This is listed in the Report server list found within AX. To find this list please read the description in Appendix 1 – locating the SSRS names. From here navigate to the URL specified in the field Report Manager URL. If this does not open up succesfully go directly to restarting the SSRS service. Click on the report to show it. If a report is shown the report server and the connection works. If not printed successfully you might be presented with an error description pointing you in a useful direction. The WCF part of the AX configuration describes the service ports available. It can be usefull to rebuild these in some circumstances eventhough you do not think they have been altered. To update this open the Microsoft Dynamics AX Client Configuration on the server running the SSRS. Click Manage and “Open a configuration file…”. Navigate to C:\Program Files\Microsoft SQL Server\MSRS11.<Name of the relevant instance>\Reporting Services\ReportServer\bin and select the file Microsoft.Dynamics.AX.ReportConfiguration.axc. Waiting for the WCF to be rebuild. When completed click Apply and “Manage / Save configuration file”. After saving the file restart the SSRS-service. The name of the server can be found from within AX by looking up the reporting server(s) listed in “System administration / Setup / Business intelligence / Report servers”. Notice, that the list can contain multiple SSRS instances and not all of them are related to the environment you are trying to fix. This is a fairly quick service when it comes to restarting so you will not be troubling users for that many seconds. Log on to the server running SSRS. 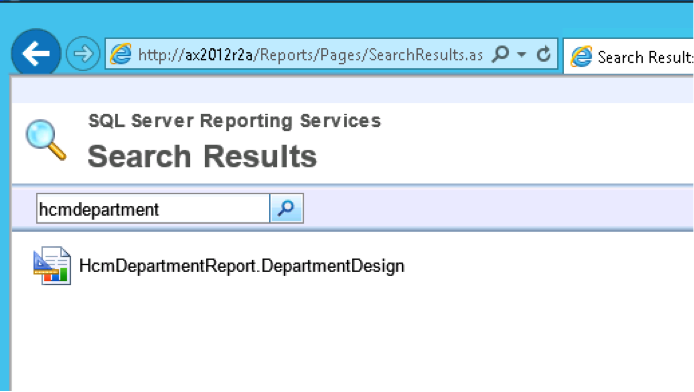 From here locate the service “SQL Server Reporting Services (<Name of the relevant instance>)” and restart it.